The reader comes complete with WHQL approved Windows drivers, as well as support for other operating systems such as Linux, and is ideal for all smartcard applications, including electronic tachograph reading solutions, where physical stability is important. The CardMan 3121 is one of Omnikey's leading readers and boasts both great performance and quality. 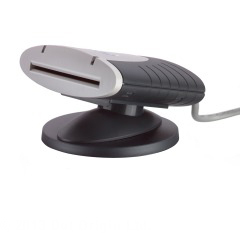 This model comes complete with a special 150g heavy foot for vertical or angled desktop use and an integrated sticky pad for alternative mounting.